Believe it or not, baseball season started over a week ago, on Saturday March 22nd. The Arizona Diamondbacks played the Los Angeles Dodgers twice — in Sydney, Australia. The Dodgers won both. Then there was no baseball at all until yesterday, when the Dodgers played the San Diego Padres right here in America — imagine that! The Padres won. Discussing what he was best at. This is wack. Once upon a time, baseball honored its own history and traditions. The season’s first game was played every year in Cincinnati, home of the league’s oldest surviving team. I happened to be there in Monday, April 1st, 1996. It snowed. After just 7 pitches, home plate umpire John McSherry, all 328 pounds of him, dropped dead of a heart attack. Now, that’s entertainment. That’s tradition. Anyway, it’s a pretty full schedule today. I’ll be heading over to the Liquor and Rubber Balls Sports Emporium and Lasik Surgery Clinic to catch the season opener between my Fluffya Fullies and their historic rivals, the Texas Rangers. That’s wack, too. Interleague baseball is a bad enough idea on its own — starting the season with an interleague game makes no sense at all. What do the fans of either team know about their rivals today, and why do they care? Not that I won’t be thrilled to see the Rangers’ starting pitcher, Tanner Scheppers make his first major start (and maybe his last). Gelb used the M-word. Stupid, stupid, stupid. 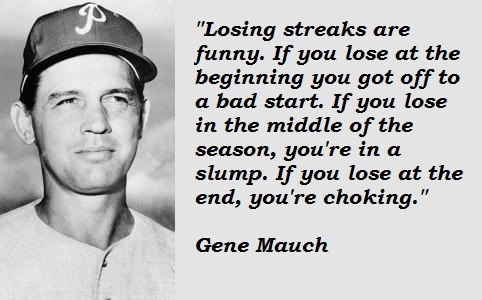 I’m not going to dwell on this here (again), but Gene Mauch wasn’t only the worst thing ever to happen to the Philadelphia Phillies, he was the worst thing that happened to Philadelphia fans of any sport. His inept stewardship of the team in 1964 — yes, this is the 50th anniversary of The Greatest Collapse in Sport History — soured three generations of Philadelphians, who devolved into nationally notorious boo-birds, pessimists, brawlers, drunks, and thugs. And perversely proud of it, too. Not even the team’s World Series victory in 1980 — its first for a franchise founded in 1883, but any team can have a bad century — exorcised the demons. Somewhere in the 1990’s, when I was no longer local to see it for myself, younger, unhaunted fans started replacing the zombies, and matters have improved substantially. For a while there, when the team was winning lots of games, Phillies fans were prominent, even ubiquitous, in every stadium in the country. No question, this season is a challenge. The team is old, the sparks are cold, and there doesn’t seem to be a master plan. Bringing up Mauch was a real bad move, Gelb. Not that baseball fans are superstitious or anything. Nevertheless, the season opener is an event every baseball fan looks forward to, even here in the Banana Republic where whole dozens of fans are expected to stroll into Marlins Park around the second or third inning, some even glancing up from their cell phones now and then. Owner Jeff Loria and his pet monkey Davey will be watching from their bullet-proof box, no doubt pondering new promotional antics to distract spectators from the catastrophe they’ve created. I understand you can buy tickets with bitcoins, now. That should boost attendance nicely. 8 Responses to Play Bawl! White I really hate agreeing with all the experts and pundits who are down on the Phillies this year, in fact they’re pretty lame. Until Rollins and Howard prove otherwise, there’s no reason to expect them to return to the form they were even 3 years ago. The team made some bad decisions and moves, and the rest of the league got better. Even your craptacular Marlins. Quite whining. I’m a Cubs fans, remember? See you at LRBs. Wow, what a game. If I’d stayed home I’d run out of beer. Wasn’t Shibe Park any more in 1964 — it was Connie Mack Stadium, named after the first of a long line of smacked asses who achieved notoriety in Florida politics. Hank Goldberg, whose radio shows dominated south Florida’s sports talk ratings for many years, would refer to it only as “the stadium formerly known as Joe Robbie” in a sneering protest to the raw commercialization of the franchise.